Cartoons have always captured the imagination of children. No surprise, schoolbags imprinted with cartoon characters make an attractive tantalizing gift, and importantly a timely one as the schools have just started. The schoolbags, bringing alive the immortal Disney characters, will make an attractive giveaway. For example, Mickey’s schoolbag will sure bring more fun, more excitement! It’s ideal to hold your little champ’s study gears. Now, Tom and Jerry Mickey Mouse and Donald Duck are there to accompany children to the classroom, bringing smiles on their faces. Let the children strut to school with Mickey Mouse and Scooby Doo in company. A soft toy-like bag will be perfect for nursery going children or those in junior or senior KG. The catchy colored teddy bear bags will sure make going to school a pleasurable exercise for children and draw them towards studies as well. Check that the fur used is of good material and is soft to touch and feel. An off white school or college backpack will make a more sober choice. Adjustable straps at both the sides for adjusting the width of the bag will make it easier to sling around and carry. Adjustable straps at the bottom will help adjust the width of the base. The smaller padded back section can easily hold files, stationery, etc. When buying a bag, check the quality of the zip. Get one in bright colors to cheer up the children. 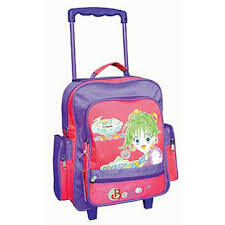 Also, ensure it is spacious enough to carry their school gears like books, notebooks, pen holder and pencil box. It should have a separate pocket to carry the lunch box. Adjustable straps and a haul hook for easy lifting are other features to look for. The bag should have enough front pockets, and it shouldn’t be too heavy.